yourFXguide-Every successful currency trader has an effective trading system installed on his or her trading platform. If you are a scalper, that means if you trade frquently, "Zebra Desert Eagle" forex trading system is for you. 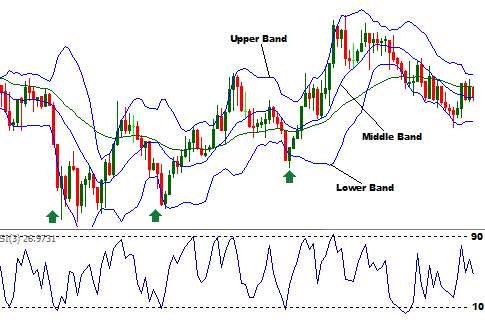 "Zebra Desert Eagle" forex trading system is composed of two technical indicators Bollinger Band(default setting) and 3 period Relative Strength Index(RSI). The levels of the RSI should be customized as 10 and 90. This forex trading system should be applied on 5m chart not larger than that. We know that RSI is an oscillator that moves up and down within a range to explain the oversold and over bought situations of the market. 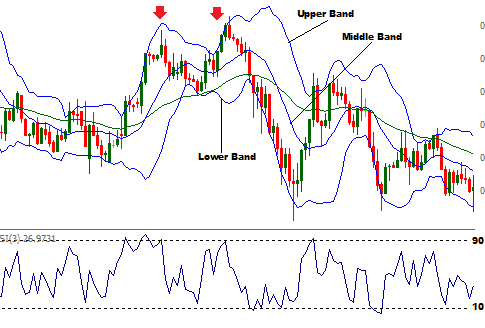 Bollinger Band is a trend indicator that has three bands such as upper band, lower band and middle band. 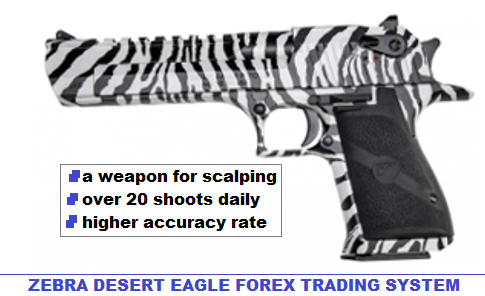 How to execute a long trade with "Zebra Desert Eagle" forex trading system? (3) Stop loss will be placed 10 pips lower than the entry price. (4) Profit target will be placed 10 pips higher than the entry price. In the above illustration, we can see long trade opportunities, marked with green arrows, with this trading system. How to execute a short trade with "Zebra Desert Eagle" forex trading system? (3) Stop loss will be placed 10 pips higher than the entry price. (4) Profit target will be placed 10 pips lower than the entry price. In the above illustration, we can see short trade opportunities, marked with red arrows, with this trading system. Remarkable, this trading system may provide inaccurate signals, if there is any important economic or political events. Traders should not trade with this trading system, during any important economic or political events.